You have a beautiful new website but how long will it last? 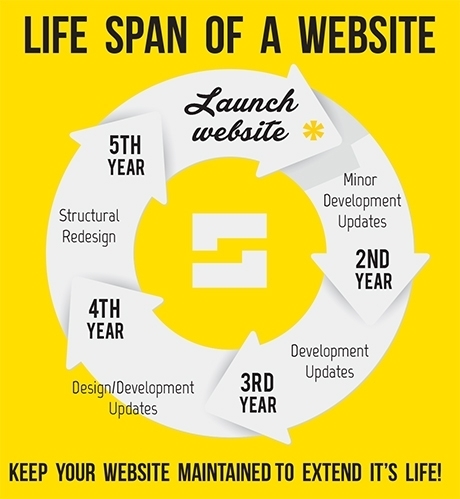 With the rapid changes on the web over the last few years the lifespan of a website has shortened to 3-5 years, most now would say 3 years before you need to start planning for the new website or rebuilding/redesigning your current website. Technology is moving at lightning speeds and with it web languages are constantly changing, browsers and computing devices are changing, World Wide Web standards change, servers change and with all of these things changing development code from just a couple years ago may not be supported, older code can slow down your website or it may not be viewing correctly on a new device, and when a 3rd party API or plugin gets updated it can effect your website. The older the website the more frequent updates or fixes may have to be made. With open source CMS's such as Wordpress, an open source plugin used for the CMS may no longer be supported by it's creator and a new solution may have to be implemented. Your website is ever evolving. It's hard to believe the first iPad came out just five years ago. At that time the iPhone was the only widespread smartphone in use and mobile web browsing was low. Americans who own a smart phone has more than doubled since then and we are now at over 50% of users using mobile devices for web browsing. Screen resolution has almost doubled in the last 5 years!... which means that a website from 5 years ago will look small in the browser. What will the web look like in 5 years? We at Skuba are committed to using modern development code. Our developers are constantly learning and applying the latest technology. So if you ask how long will your website last be assured that at Skuba it will last as long as it can, meaning we have developed it with the latest. Unfortunately there is a HUGE variance in developers skills and knowledge and equally large variation in web development firms. You may not be aware that Wordpress "developers" cannot actually write much if any code and have very little understanding of the web. How can this be? Well, unfortunately anyone can call themselves a developer. Our developers are all senior level developers with an average of 10+ years of experience. When getting quotes keep in mind the you often get what you paid for. Hire an established, accomplished and experienced team. It will save you money in the long run. When launching a website keep these things in mind. Too often companies pay for a website and think it's done and should work forever. Please know websites are ever evolving creatures. Changes will be needed, bugs will pop up. As changes are made to 3rd party plug-ins, APIs, WWW, new devices come out, browsers change, user interface design changes etc your website will need work done on it. As google updates it's algorithms for SEO so will your website need to be updated or you may be cast to the bottom of search results. Plan for it to be maintained to keep it up and running. Plan for a major design/development update every 3-5 years. Allow a professional to take care of it to extend it's life. Websites are your forward face to the world and likely your most valuable marketing piece. Developing award winning websites for 15 years!